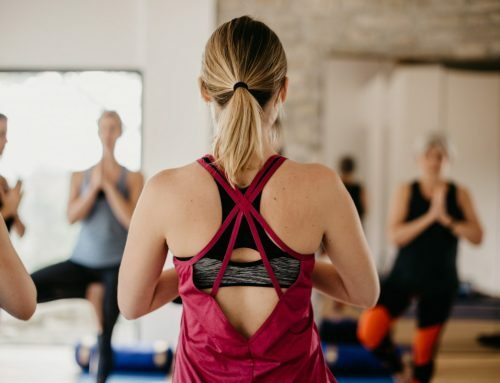 With an increasing number of people practicing yoga in their everyday life, it’s no surprise that an increasing number of people are choosing to use their holiday time to delve deeper in their yoga practice, on yoga retreats & trainings. At Domaine de Mournac, one of the venue hosts Lucy is a qualified yoga teacher, but focuses purely on the hosting & behind the scenes work, as well as looking after the junior team members of course! 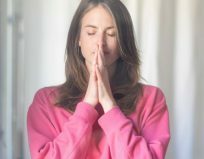 So when yoga teachers visit to host retreats, it’s very useful to see what works well on retreats. I’ve been very sweetly asked for some advice about putting on retreats. Full disclaimer I have taught 3 and created 1 from scratch with Matt. I’ve also worked as a host at a surf camp and been in hospitality many years prior to that. I am purely speaking from my ‘limited’ experience but I thought it would be fun and also hopefully useful for others who are thinking of running them. First up is coming up with an idea. 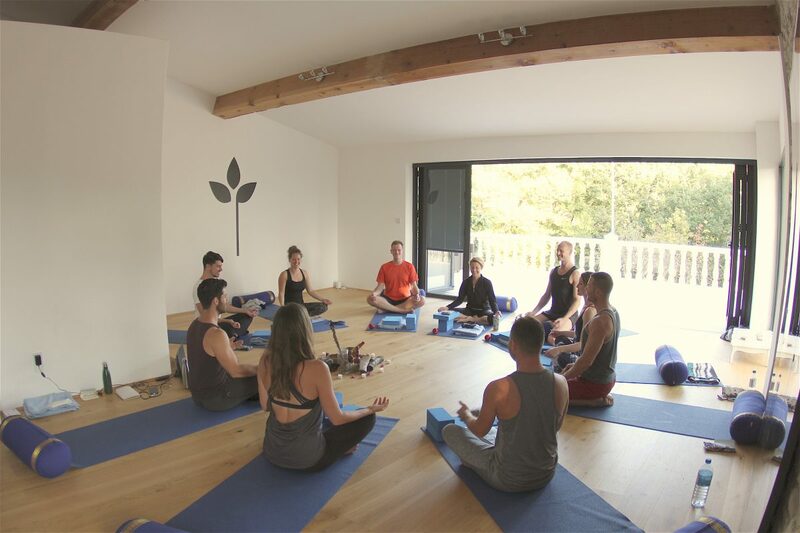 Tip 1 – Think about why you want to run a retreat. What is the intention behind it? What do you hope people will get from the experience? This will be the thread that informs everything you do for the retreat. Tip 2 – Do it with someone who you trust and has complimentary skills. 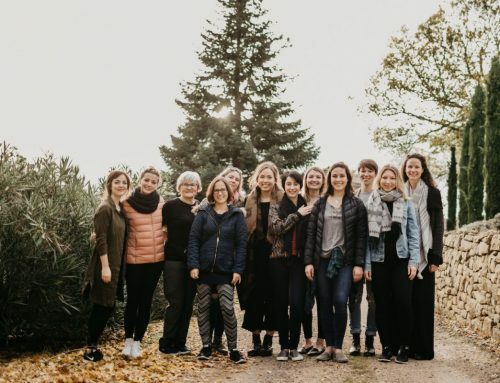 I’ve co-taught two retreats with friends and it worked brilliantly. Plus you always have someone to bounce ideas off, share the workload and share the fun with. Tip 3 – Think about what sort of location you want to take your guests to. Then look and transport costs to the area and add that into your costings. Tip 4 – Scout out potential retreat houses. Unless you have all the props yourself then I’d recommend using a retreat house that has everything ready for you. 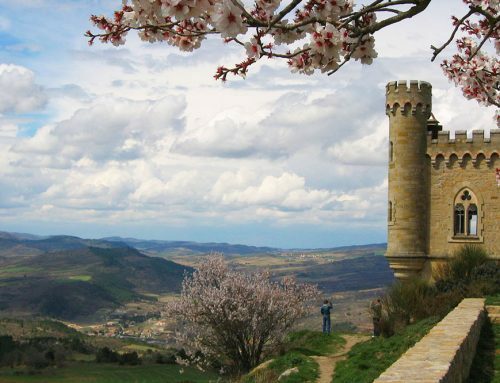 This was the case with Domaine de Mournac and when I’ve been on retreat and all the props are ready and in abundance it makes the whole experience much more pleasurable. Tip 5 – Work with a retreat house that has a super helpful host. 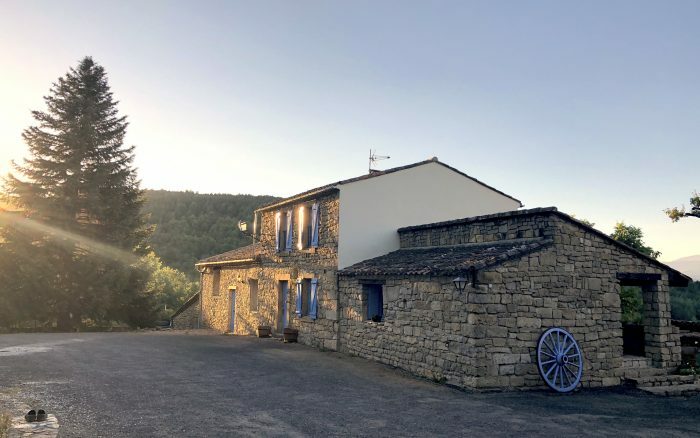 I can not recommend Lucy at Domaine highly enough. She was organised, proactive and really helpful for all of our questions. Tip 6 – Once you have all your costings then get promoting. I’d recommend a minimum lead time of 6 months till your retreat, ideally longer! You’ve got your idea, now how are you going to actually deliver? Tip 1 – use your theme/intention to guide the plan for the classes. Have it weaving through each one but also allow space for delivering what the students need who are in front of you. Tip 2 – ask what brought your guests to the retreat and what their intention is. It’s fascinating to hear the responses and also builds rapport from the get go. Tip 3 – focus on the details. 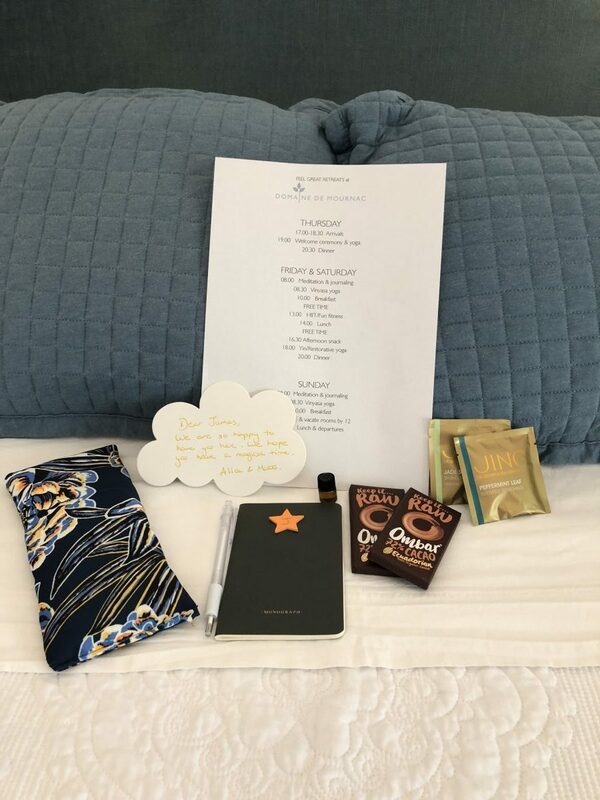 Matt and I put together little touches for our guests such as the goodie bags with homemade gifts. Think of what would bring joy to your guests. Tip 4 – give people space. People come on a retreat for a lot of reasons. Let them have space so they can unwind and get the replenishment that they need. Be open and available when people are ready to come back to the group. Tip 5 – adapt your classes as the retreat progresses. Matt and I made our classes complimentary to one another and we lifted words that each other said so that there was repetition and flow between each practice. Tip 6 – use your surroundings and think outside the box. 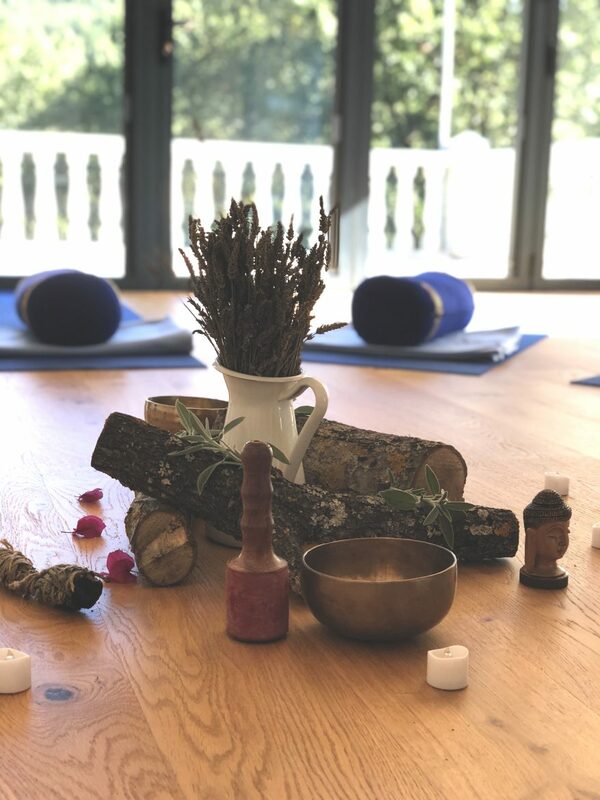 We made an altar from petals and logs from the house inspired by another yoga teacher visiting Domaine de Mournac, Katy Bateman. The first meditation was spent walking in quiet appreciation around the grounds of the house. We also took an impromptu trip to a famous site that honours Mary Magdalene with the most spectacular views. Tip 7 – make things optional. This relates to points 6 and 4. Never pressure people into doing something if they want to chill. It’s their holiday after all. Forced fun isn’t fun! Tip 8 – enjoy it all and take it in. I spent time journaling, lazing in the sun, soaking it all up. I felt so content on this retreat and wanted to bottle up that feeling. Taking time to appreciate everything you’ve put together is really special. If you run a retreat with a buddy then spend time giving them appreciation too. Tip 9 – suggest having quiet time first thing in the morning. Matt and I both loved this on our YTT. No phones and no talking until after meditation allowed people to switch off more and disconnect to reconnect. How fantastic was that, now what are we going to do? Tip 1 – Once you’re coming to the end of the retreat ensure you ask your guests for feedback. It’s so useful to hear about their experience so you can improve for next time. Tip 2 – Collect all your pictures and organise them into files for your next retreat. Tip 3 – if you and your guests loved the house then book for next year! 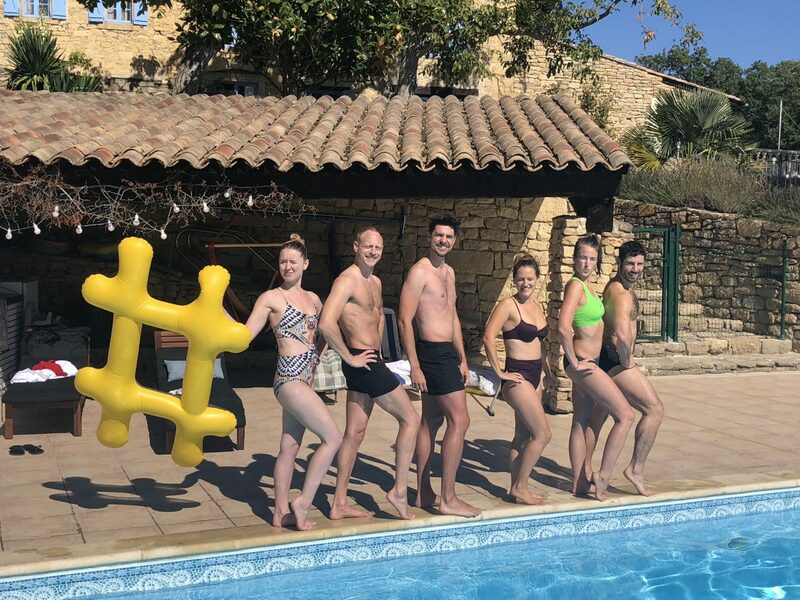 We are running our retreat again this year from August 30th – September 6th in 2019 at Domaine de Mournac. It’s going to be bigger and better than ever! Tip 4 – reflect with your retreat partner, or by yourself on what worked, what could have been better and what you’d like to do next time whilst everything is fresh. Book now with Alice & Matt for 2019, details here!